Morrisburg Dive Sites – Explore the Rapide-Plat Canal and Lock 23. The title says “Lock 23” but there are actually two locks: the first and smaller Rapide Plat Lock built in 1847 and the larger Lock 23 completed in 1905. They lie side by side creating two areas to explore. There’s a third inner channel leading to the foundations of the municipal hydroelectric plant, followed by a myriad of posts and cribbings of piers, boathouses and shoreline structures, with all kinds of stuff lying around. There’s the municipal wharf and the ferry dock with its road leading inland. And there are more sites along the Rapide Plat Canal as it extends a few kilometres upstream. The gates of both locks were dismantled in 1959 for the Seaway flooding, as were the buildings and machinery on top of their walls. Most of this debris was simply pushed into the lock spaces where it still remains. Most dives at Lock 23 start at the same place and end at the same place. 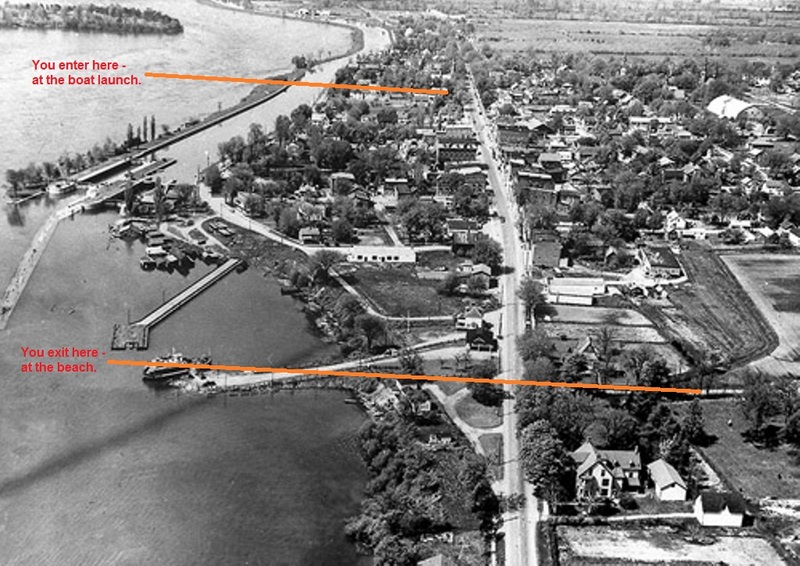 Here’s a great photo showing just how much the village has changed in relation to the dive site! Water temperature is comfortable for wet-suit divers by mid-June at 60F/15C, increasing to at least 72F/23C by mid-August. Current is variable. It’s always there of course – it’s a river – but the speed of the drift depends in part upon the control dam at Iroquois, 12 km upstream. The current is consistently strong at the tops of the locks because of water flow around and over the walls. Inside the old lock and hydroelectric plant channel there are back eddies and when you get to the boathouses and wharves, there is almost no current at all. Visibility is also variable, though it generally averages 10-15 feet. It is often better and occasionally worse, but the site is always easy to view and enjoy. The deepest part is just over 40 feet. The tops of all the walls are less than 15 feet. The St. Lawrence shipping channel lies well beyond the lock walls and is much deeper. Along the shoreline there are weeds – very small in the spring but grown into a forest nearly reaching the surface by the end of the summer. They’re not an entanglement worry because they pull out with a simple tug. They pose no problem within the site itself but they can be a bit irritating at entry and exit. The river runs generally east, and Canada lies north!